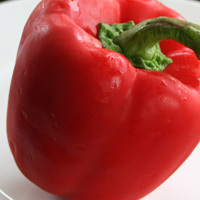 With more vitamin C than an orange, and a spot on the coveted super food list, red pepper is the go-to vegetable to know and eat! It's much sweeter than it's counterpart the green pepper and a great addition to spreads, salads, soups, and dips. Selecting- ripe red peppers will have deep, vivid colors, feel heavy for their size, and be firm enough to yield only slightly to pressure. 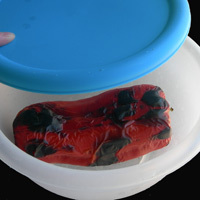 Freezing- slice peppers into strips and freeze for up to 6 months. Run under warm water to thaw and eat. 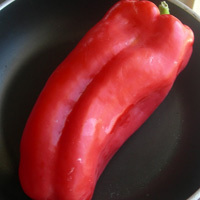 pan over medium high heat. 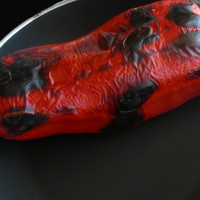 When the skin becomes blackened, flip the pepper. Continue rotating the pepper until all sides are blackened. Place the pepper in a bowl or brown bag for 15 minutes. This will make it easier to take off the skin. Peel off the skin. Some remaining blackened spots are okay. This is not a process of perfection. Just quickly remove the skin that peels off easily. 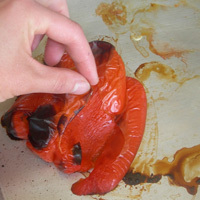 Remove the inner seeds, and cut the roasted pepper according to recipe specifications.